Apparently the most exciting thing that happened to me in 2017 was the light fixture update, and I had nothing else to report after that. As usual though, I can’t believe 2017 has flown by so quickly. It’s already December 31st (stating the obvious) and tomorrow it will be 2018 (…and again). And as usual, I let the posts and general site maintenance trail off. Well, for what it’s worth, I added a new portfolio entry: Spotituber. Yes, what a name, what a name. I did that quick project back in the summer for the interns, but never got around to adding it. Still up though! And still works! 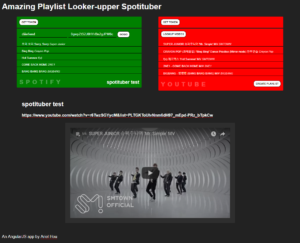 The CSS is admittedly a little lacking right now though: the green of Spotify really doesn’t go well with the red of Youtube. But I know it’s beyond that–I must admit that with all the crazy things one can do with CSS these days, I feel a bit of analysis paralysis with what in particular I want to do with something. Back in the days of CSS 2 I could just slap on a couple of borders (maybe a dashed border-bottom with an underline? So cool.) and some color changes and it’d be set–pretty snazzy, right? But now there’s opacity, there’s transform, there’s functions and the sky’s the limit. It’s all too much really. But aside from that, other major landmarks of 2017 include getting AWS Solutions Architect certified (a more grueling test to study for than I had initially anticipated) and a light kitchen renovation (also a more grueling test than I had initially anticipated). And yes, Niku is still here lording over us. And no, I’m not a crypto-billionaire. (I’m firmly in the “What…? How…?” camp.) DESPITE that, 2017 was a good year. Onwards!